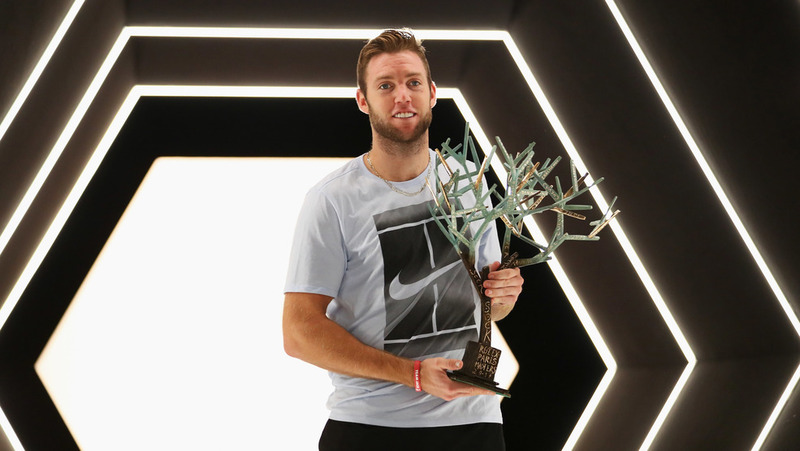 PARIS, France - His talents have been on full display for years, but Jack Sock put it all together to win the Rolex Paris Masters this past week, beating fellow surprise finalist Filip Krajinovic for the title. He won by far the biggest title of his career. This Masters 1000 title is much bigger than any of his previous three career ATP World Tour titles, all of which came at the 250-level (on the clay courts of Houston in 2015 and then two hardcourt titles earlier this year in Auckland and Delray Beach). He’s the third player born in the ‘90s to win a Masters 1000 title. Either he or Krajinovic would have done it, but with a 5-7 6-4 6-1 win in the final, it was Sock that beat the Serb to the stat. The first two ‘90s babies to do it were Alexander Zverev (Rome and Montreal) and Grigor Dimitrov (Cincinnati). He’s into the Top 10. Sock rose from No.22 to No.9 on the ATP World Tour Rankings on Monday, soaring past his previous career-high ranking of No.14, which he achieved in April earlier this year. He’s into the ATP Finals. Sock joins Rafael Nadal, Roger Federer, Zverev, Dominic Thiem, Marin Cilic, Dimitrov and David Goffin in the field for the Nitto ATP Finals, which take place next week. He’s the first American to qualify for the ATP Finals in six years. The last time an American qualified for the season-ending ATP Finals was in 2011 (when former World No.7 Mardy Fish did it). He ended Krajinovic’s winning run against his fellow Americans. Last week, the No.1 and No.2 Americans were Sam Querrey and John Isner, and Krajinovic took both of them out en route to the final in Paris - Querrey in the second round, 6-4 6-4, and Isner in the semifinals, 6-4 6-7(2) 7-6(5). Of course, Sock now becomes the new American No.1, leapfrogging both Querrey and Isner.